Bibliomovil parked outside the San Ramon office. One of Planting Hope’s most ambitious and long-hoped for programs, Biblomovil, went into full in 2012 with the long-awaited delivery of our very own yellow bus. Now, school age children in nine rural communities around Matagalpa have access to educational and early literacy material. Through the Mobile Library program, teams of Planting Hope scholarship students and staff visit several communities each week to provide children’s story time and activities, homework assistance, use of text and reference books, and the opportunity for teachers to borrow books for the week. While studying at Skidmore College, Vermont resident, Jenna Cameron, wrote a grant to the Davis 100 Projects for Peace Foundation, collaborating with Planting Hope on this initiative. See Jenna’s proposal here and read more about her project here on pages 46-47. Planting Hope then partnered with the Henniker-San Ramon Sister Communities Project, and Green Mountain Coffee Roasters, to make the project a reality. Acquiring the bus saw its own difficulties as Jenna traveled to Nicaragua to see the bus begin its service. 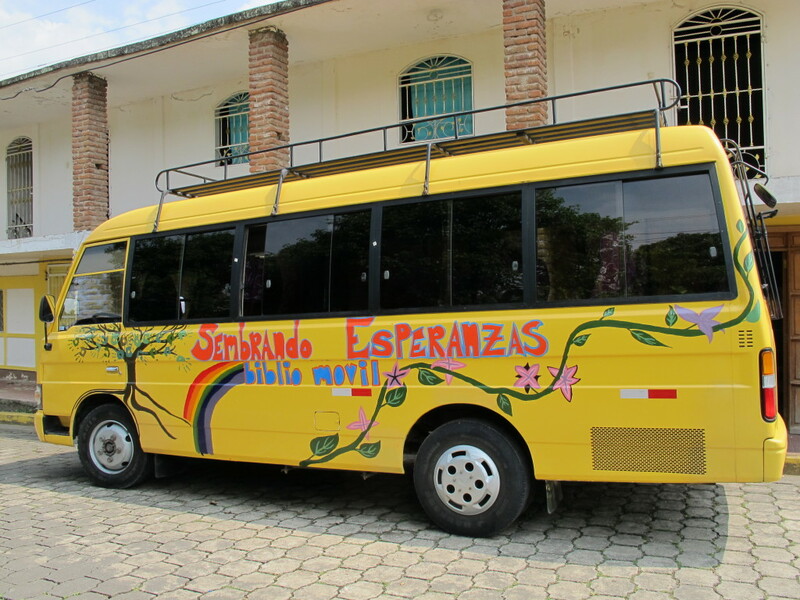 Instead she and Planting Hope staff were faced with bureaucratic red tape and long lines as she worked through the approval process to have Planting Hope’s non profit status exempt the bus from Nicaraguan taxes. Undeterred by the holdups, the BiblioMovil team, began collecting books from local residents, issuing a library card system for the 800+ new rural patrons and hauling books to school children along the dirt roads of rural communities by any means available including on the backs of Planting Hope staff and volunteers. The bus has come with some lessons for Planting Hope as well as some unexpected rewards. Although the bus’s arrival was eight months later than expected, it has quickly become Planting Hope’s most successful micro business. To date the bus has generated nearly $9,000, renting itself out to tourist and national groups who need express transportation. So that it doesn’t interrupt the mobile library’s schedule, another vehicle is utilized when the bus is making other trips. The income generated by the bus is enough to cover the cost of all Planting Hope scholarship students. The bus also serves as transportation for our many delegations and long-term volunteers. Before the arrival of the bus Planting Hope would have to rent a bus to get delegates to service sites. The bus has also been a fantastic asset for Planting Hope’s reuse store “Chereques” as the bus can be seamlessly transformed into a mobile home goods store. Stopping in the communities we serve and setting up shop for a few hours before it’s off to the next destination.